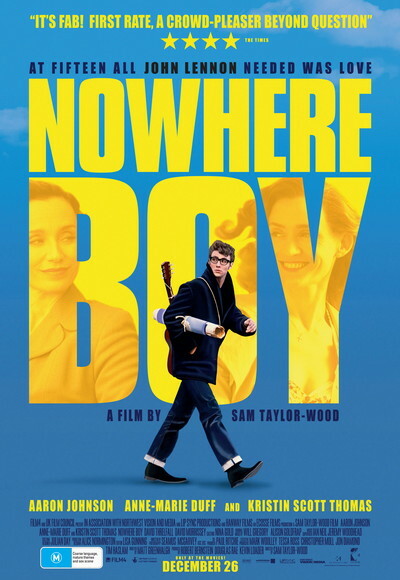 Story: "Nowhere Boy" tells the never before seen story of John Lennon's (Aaron Johnson) childhood. John Lennon is an ordinary fifteen year old boy on the streets of Liverpool. Funny, smart, naughty, a real edge to him. But life is not simple for John - he grew up in a family of secrets and was raised by his Aunt Mimi from the age of five. When he is suddenly reacquainted with his mother, Julia, they form an unbreakable bond. A bitter war rages between the two sisters for John's love. Faced with bringing it to an end, he learns the secret heartbreak of his past. But his mother gives him one great gift - music. A wayward boy finds his voice, and walks into The Beatles.